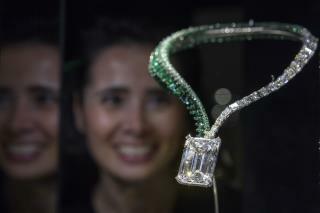 (Newser) – The largest-ever D-flawless diamond to be put up for auction, mounted in a diamond and emerald necklace, has sold for $33.7 million at Christie's in Geneva, including buyer's fees. The white, matchbox-size "Creation 1" diamond from Swiss jeweler de Grisogono weighs a whopping 163 carats, the AP reports. The buyer was not immediately identified. Also on the block Tuesday was Le Mazarin. The 19-carat pink diamond that once belonged to King Louis XIV, Napoleon Bonaparte, and other French rulers sold for a hammer price of $12.6 million, obliterating the pre-sale estimate. That diamond was up for auction for the first time in 130 years. Bet he'd trade it for a gallon of water if there was nothing to drink anywhere else. I'm FINALLY getting the Christmas gift I've been whining for. Thanks, honey! I have a bag from Burger King that I once mistook for a traffic map when I became lost in traffic after consuming fast food.